"Now offering CNC laser cutting"
Specialty Steel Inc. is a progressive company located along the Trans-Canada Highway. Specialty Steel was incorporated in June of 1983 and began operations shortly thereafter. It moved into an expanded facility in 1986. Specialty Steel operates under the principle of total quality management. Our objective is to meet our Clients requirements and to provide them with the highest quality of products and services. 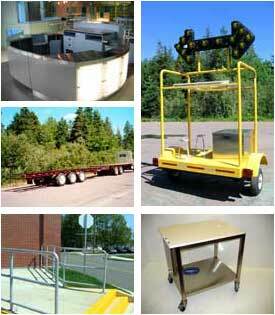 Custom Stainless and aluminum products. Our plant is equipped with extensive metal fabricating abilities including Aluminum and Stainless steel. It features in house sandblasting and painting facilities. All products are designed, engineered and tested within the premises. Specialty Steel has CSWA (Certified SolidWorks Associates) on staff. Our design staff uses SolidWorks 2015 to take your project from concept, to design, to production or import and use your existing files. Copyright© 2011 Specialty Steel Incorporated. All rights Reserved.